Rutgers Taiwanese American Student Association’s (TASA) biggest event of the spring semester is finally here: Nightmarket! 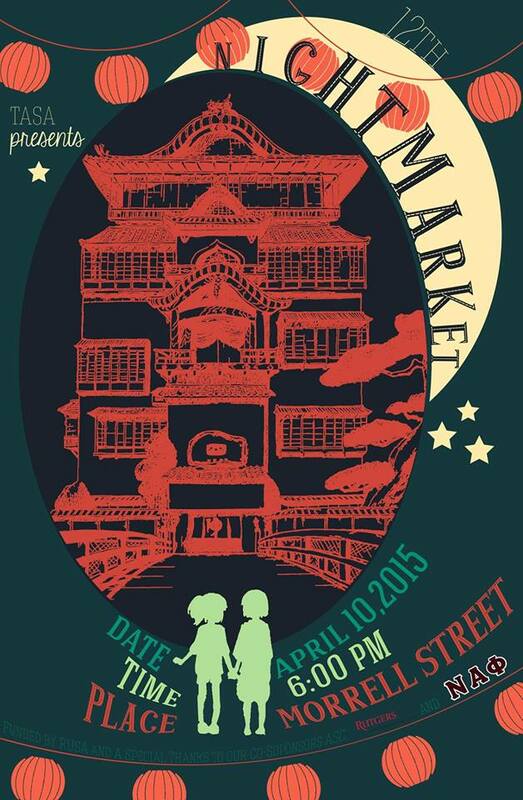 Get ready to be “spirited away” because we’re bringing you a taste of the popular Taiwanese night markets — TASA style. So what’s happening? – There will be tons of really thrilling games that help you win awesome prizes! Try your hand at games such as Go-Fishing, Basketball, and Waka Smash! You’ll definitely find something you’ll like from our extensive prize booth. We have plushies upon plushies of everyone’s favorite characters! – Make sure to bring two stomachs because there’s going to be a lot of yummy foods! Treat yourself to a wide variety of authentic Taiwanese street foods that are sure to please your taste buds! Don’t forget to wash down all that food with bubble tea! – Take a break from the games by watching some of the talented performances from members of our own Rutgers community! – Finally, enjoy your spiriting away with the themed photobooth to remember the sweet memories of this amazing event. If you have any questions, comments, or concerns, please contact us at [email protected] or message us on Facebook!